August is an interesting month for Edinburgh. It is a month where the population of the city more than doubles as hundreds of thousands of people flock into the city to take part in the festival. In reality, there are many a festivals going on simultaneously. There is the Fringe Festival (comedy), Edinburgh International Festival (theatre/arts), Tattoo (military), and I am sure more that I am failing to mention. The chaos that makes up the city right now reminds me of Pasadena leading up to and during the Rose Parade. Things become overcrowded, litter is everywhere, alcohol is free-flowing (you can wonder the streets drinking here), street performers are a dime a dozen and the entertainment is nonstop! On Friday night, Ian and I took advantage of the festival and went to a comedy show. It was quite funny. And I have to admit, the best part was when the guy was making fun of Americans; though Ian says it was so funny because we are American, but whatever! 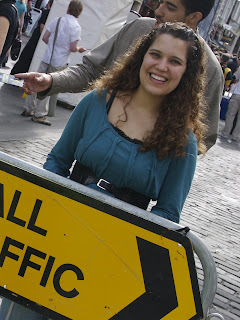 Then on Saturday, we wondered around in the chaos that is known as the Royal Mile. You can barely walk, the crowd is so thick. Then, every two feet people are thrusting papers in your face advertising a show. And you gotta look down every once in a while to make sure the people with strollers don't ram you! 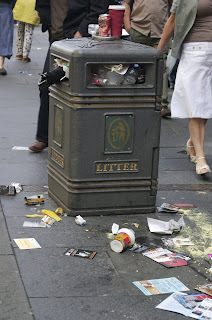 Though I was a little disgusted with the amount of litter everywhere, I was entertained by the crazily dressed people and tourists galore. It is going to be an interesting month for us here in Edinburgh!